Public service has been the focus of Pat’s career. Indeed, he has a total of 35 years of public service experience—28 years with the Clarksdale Fire Department, where he attained the rank of assistant chief, and 12 years with Pafford. 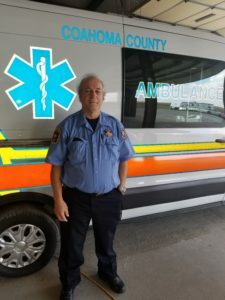 He has been a valued member of the Pafford EMS team since he joined the company full-time after retiring from the fire department. Pat demonstrates a true commitment to his patients and keeps his lines of communication open to family members, readily answering their questions, and often making sure patients are doing well after the call. He goes beyond the call of duty. Pat aims to provide optimal service to patients and he leads by example, supporting his coworkers in their quest to offer the finest care. He single-handedly revamped our station supply system for improved accessibility and inventory—the behind-the-scenes work that’s not always seen but keeps the company running at top efficiency. He is a can-do medic who is always willing to help out around the station, no matter what the task. He’ll happily stay over covering shifts, building cabinets, or giving the rookie crew members sound advice. He takes the initiative to improve the workplace and the company’s morale—and save lives. Pat has been honored by Pafford twice with the Johnny Gage Award for most patients transported in his district. He displays a true example of giving your all and asking for nothing in return, each and every day. We are so pleased to nominate him as our Star of Life for our Mississippi operation.